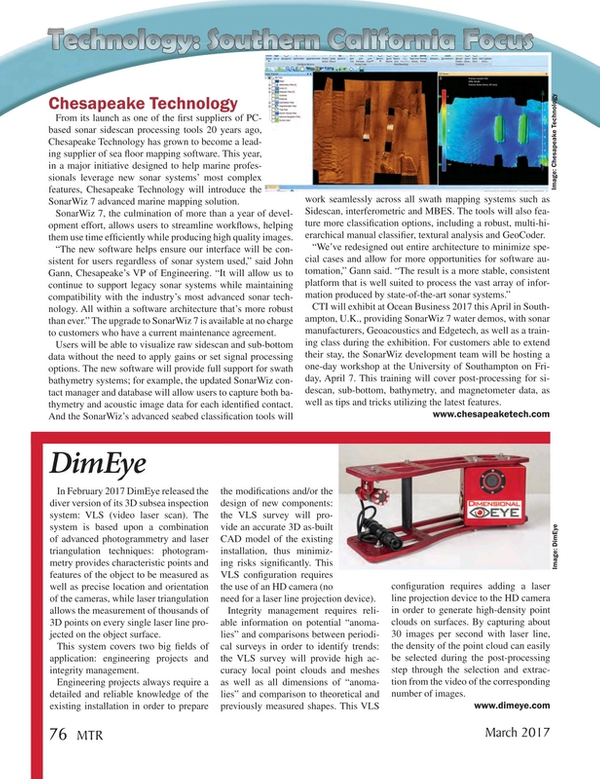 In February 2017 DimEye released the diver version of its 3D subsea inspection system: VLS (video laser scan). The system is based upon a combination of advanced photogrammetry and laser triangulation techniques: photogrammetry provides characteristic points and features of the object to be measured as well as precise location and orientation of the cameras, while laser triangulation allows the measurement of thousands of 3D points on every single laser line projected on the object surface. This system covers two big fields of application: engineering projects and integrity management. Engineering projects always require a detailed and reliable knowledge of the existing installation in order to prepare the modifications and/or the design of new components: the VLS survey will provide an accurate 3D as-built CAD model of the existing installation, thus minimizing risks significantly. This VLS configuration requires the use of an HD camera (no need for a laser line projection device). Integrity management requires reliable information on potential “anomalies” and comparisons between periodical surveys in order to identify trends: the VLS survey will provide high accuracy local point clouds and meshes as well as all dimensions of “anomalies” and comparison to theoretical and previously measured shapes. This VLS configuration requires adding a laser line projection device to the HD camera in order to generate high-density point clouds on surfaces. By capturing about 30 images per second with laser line, the density of the point cloud can easily be selected during the post-processing step through the selection and extraction from the video of the corresponding number of images.